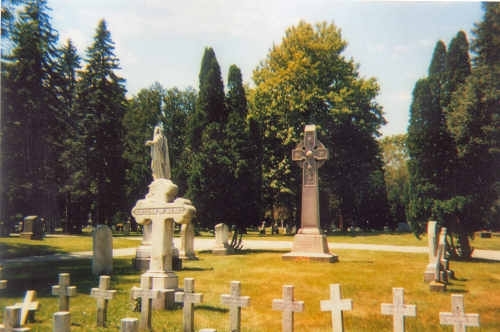 A giant Celtic Cross was erected over the grave of Rt. Rev. James Augustine Healy when he died in 1900. When you cross over the old bridge (now closed to vehicle traffic) from Main Street in South Portland, you come to a burial section that was designated for diocesan priests and Sisters of Mercy. Overlooking them is the monument to Bishop Healy. Behind the cross is a circle where the old Mount Calvary Chapel stood (destroyed in 1987) and where Rt. Rev. Amadee Proulx, Auxiliary Bishop of Portland, is interred. James A. Healy, the second bishop of Portland (1875-1900), was born in Macon, Georgia, the son of plantation owner Michael M. Healy, a native of County Roscommon, and his slave wife, Eliza Jane Clark, of white and black ancestry. The bishop, facing obvious discrimination in the South, was educated in Quaker and Catholic schools in the North. He graduated from Holy Cross College in 1849, attended a seminary in Montreal, and was ordained in that city in 1852. 2/5 based on 2 votes. Views 308 views. Averaging 0 views per day.